Our Executive Acrylic Award Series brings to the table more elite designs stunning and magnificent enough to present at any executive award presentation. Each acrylic award design is unique and creates angles of light reflection to enhance the acrylic awards visibility and elegance. We believe in offering free engraving on all of our acrylic award products. buying acrylic awards is as easy as adding to you shopping cart convenient and fast. This 3/8” thick acrylic features two curved accent bevels edging this sleek award design. The combination of clear finishes with gold and clear highlights, serves to create a variety of award options, each with its own individual appeal, but all with a modern and fashionable feel. A polished metal pin attaches through an inconspicuous hole near the bottom of the acrylic. It allows the award to stand at a slight angle for superior visibility while on display as well as adding a metallic detail that further accents the award’s stylish appearance. 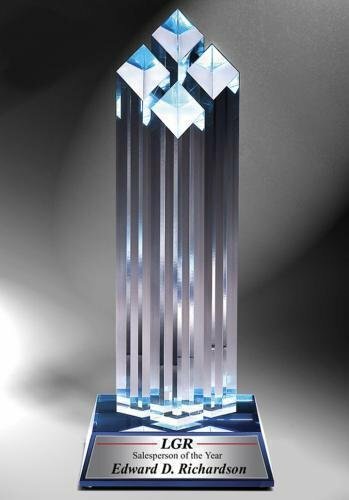 Beautiful Diamond Acrylic Award available in three sizes. 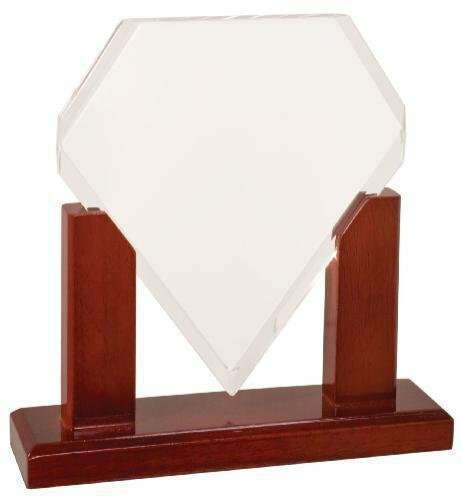 These diamond acrylic awards are perfect employee service awards, sales achievement awards and these acrylic awards are excellent for many other purposes. Each Acrylic Award boasts 1" thickness. Image shown with full color imprinting, available as an optional imprinting method to this acrylic award. Clear High Gloss Acrylic Diamond with Mahogany Finish Wood Base. 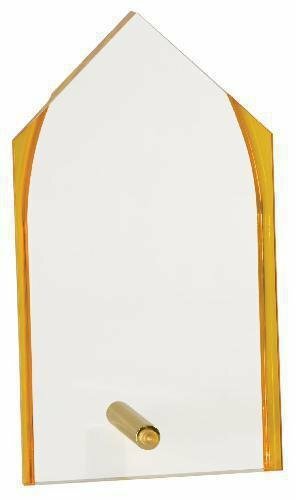 Available in multiple sizes, this acrylic award makes a Perfect employee recognition award, achievement award or sales award.